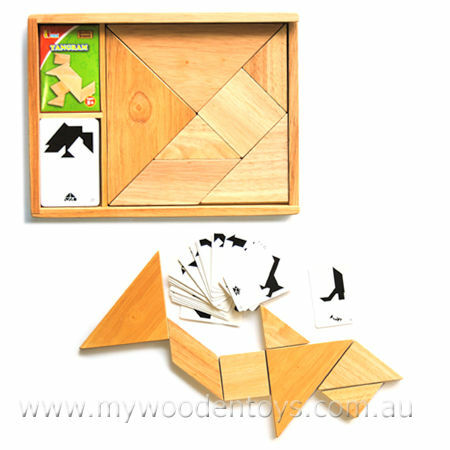 Wooden Tangram Puzzle Game has been in existence for centuries and is a Chinese puzzle which translates as "seven boards of cunning". The puzzle is a square cut into seven shapes called "Tans" the idea is to try and make the pictures on the supplied cards with the 7 shapes without leaving any out or overlapping them. Don't worry the back of each card carries the solution. Our version of Tangram comes in a lovely wooden box with a sliding perspex lid. Tangram comes with 27 cards printed on both sides so there are 54 suggestions. When you have mastered these you can find many more online. For younger children building the shapes from the cards solution is a great challenge in itself. We like this because: "It has entertained people for generations"